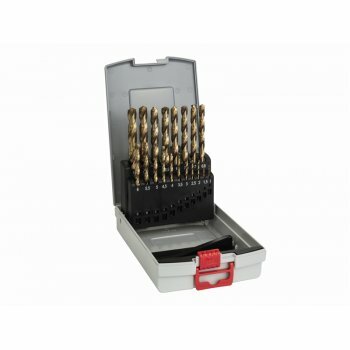 The Bosch ProBox HSS-TiN Metal Drill Bit Set contains a selection of twist drill bits made from high speed steel manufactured to DIN 338 with two-cutter, cylindrical, two flutes. They are ground from solid metal with high surface quality due to titanium-nitride coating. The shank is equal to drill bit diameter, the drill bit tip is golden in colour. 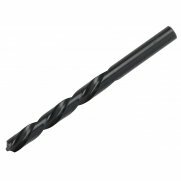 Right-hand cutting twist drill bit, Type N, 135° drill bit tip, split point manufactured to DIN 1412 C, diameter tolerance h 8. Sizes: 1.0, 1.5, 2.0, 2.5, 3.0, 3.5, 4.0, 4.5, 5.0, 5.5, 6.0, 6.5, 7.0, 7.5, 8.0, 8.5, 9.0, 9.5 & 10mm. 6.5: 63mm, 7mm: 69mm, 7.5mm: 69mm, 8mm: 75mm, 8.5mm: 75mm, 9mm: 81mm, 9.5mm: 81mm & 10mm: 87mm.